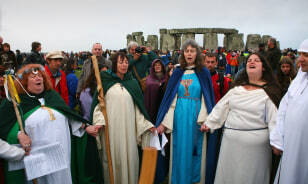 At sunrise on the summer solstice, druids, pagans and partygoers converge on a circle of stones in the English countryside to welcome the longest day of the year. The ritual at Stonehenge likely dates back thousands of years: Archaeologists estimate wooden posts and timbers were in place as early as 3100 B.C., although the monument's original purpose remains a mystery. One theory holds that it was a cemetery; another that it was a place of healing. Most archaeologists believe the large sarsen stones in the post-and-lintel formations seen in the background of this image served to mark the seasons, making Stonehenge an astronomical observatory as well as a religious center of one sort or another. Click the "Next" label for nine more slices of summer science. Meteor above Lake Mead National Recreation Area in Arizona. On some summer nights, the sky sizzles with shooting stars — which are actually space particles, most commonly shed by comets, that vaporize when they hit Earth's atmosphere. 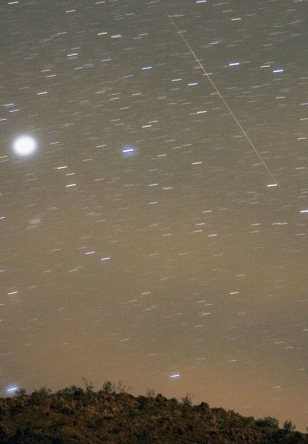 The season's most famous meteor shower is the Perseids. The show peaks in the second week of August, with dozens of meteors per hour streaking across the sky. Other notable summer showers include the southern Delta Aquarids in late July, followed a few days later by the Alpha Capricornids. Every spring and summer, salmon attempt to navigate human-enhanced obstacle courses on their journeys from the oceans to the streams where they were born. If they make it back, most fish will spawn there and die. Every year, swarms of scientists, conservationists and engineers document every move the fish make to understand why most salmon runs are in decline. Many people point their fingers at hydroelectric and irrigation dams, which can restrict fish passage. But fish ladders, such as the one shown here at the Bonneville Dam on the Columbia River, help the fish navigate the obstacles. A recent study indicated that such measures to assist the fish appear to be working. 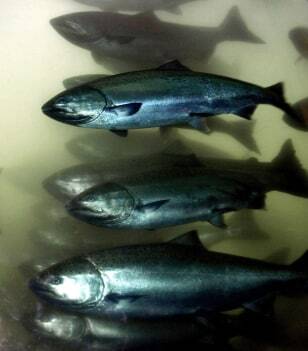 Other factors to consider as the cause for the salmon decline include agricultural pesticides and natural weather cycles such as El Nino and La Nina. Shark attacks tick up in the summer. Scientists suspect the main reason for that is simply that more people swim when the weather is warm. Experts say you are much more likely to die in an auto accident on the way to the beach than in a shark attack after you arrive. Refrain from dips when bleeding or menstruating. 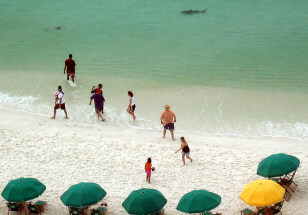 Avoid areas where sharks have recently been seen. If bitten, you should fight back with swats to the shark's head, eyes and snout, scientists say. Sharks will likely spit you out once they realize you're not a very nutritious meal, but they may not do so until you've been dragged underwater and are bleeding profusely. 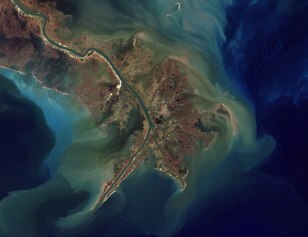 Soil and fertilizer runoff in waters around the Mississippi River Delta. Each spring, more than 200 million pounds of nitrogen-rich fertilizer from cropland in the Mississippi River Basin wash into the Gulf of Mexico. There, microscopic plants gorge on the excess nutrients, creating enormous blooms of algae. The algae die and sink to the ocean bottom, robbing the surrounding waters of oxygen. Devoid of oxygen, most life can no longer survive. The affected region is known as a dead zone. The one in the Gulf of Mexico is about the size of New Jersey, and scientists fear that it could grow even larger as farmers plant more corn for ethanol fuel processing. Corn responds well to nitrogen fertilizer, so farmers apply a lot of it, according to researchers. 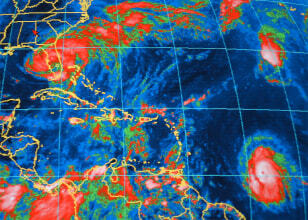 This infrared satellite image from 2004 shows Hurricane Francis over Florida as Hurricane Ivan lurks in the lower right. When a hurricane forms over the Atlantic, eyes quickly turn to the forecasters at the National Hurricane Center to learn where the storm will go and how strong the winds will blow. Although the forecasts are almost always laden with uncertainty, state-of-the-art computer models filled with real-time data on wind, precipitation, pressure and temperature — combined with more observational experience — have enabled forecasters to narrow the cone of uncertainty in hurricane tracks over the past 50 years. Improvements in intensity forecasts, however, are lagging. While some people welcome long, sunny summer days, too many gorgeous days in a row can dry out the land enough to trigger a drought — a prolonged shortage of the rainfall that humans need to grow crops and brush their teeth, among other activities. Natural records such as tree rings and lakebed sediments indicate that drought is part of the natural climate cycle, affecting parts of North America a few times per century. But what exactly governs drought? Some research indicates a link between the El Nino and La Nina weather phenomena, which periodically warm and cool the tropical Pacific Ocean, affecting weather patterns around the world. Other research suggests that drought could become more common in response to global climate change. 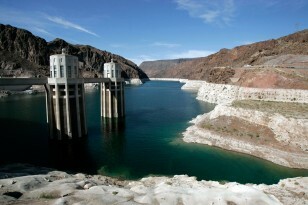 That might parch people dependent on water from the already-shrinking Lake Mead in Nevada, shown here. 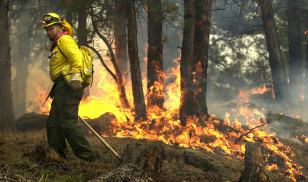 A fourfold jump in the average annual number of wildfires since the mid-1980s is linked to a trend toward earlier springs and drier summers, scientists concluded in a study. The earlier springs mean snow melts off the mountains sooner, leaving them high and dry. As the dog days of summer linger, all it takes is a spark from a passing lightning storm to send the forest up in flames. Another potential factor behind the recent flare-up is a decades-long policy of fighting fires as soon as they start, leading to increasingly fuel-loaded forests. Much of the concern about global climate change stems from what scientists see occurring in the Arctic: a meltdown of historic proportions. To gauge just how much ice is melting, scientists keep close tabs on the extent and thickness of the Arctic ice cap, a huge but shrinking expanse of ice that covers the Arctic Ocean. 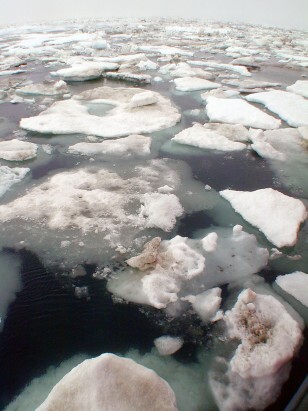 Each summer, some of the ice melts and the surrounding waters heat up, melting more ice. In the winter, new ice forms, but most years the extent and thickness of the ice cover is less than the year before. At the rate the meltdown is occurring, some scientists predict the Arctic will be ice-free in the summer as early as 2040. 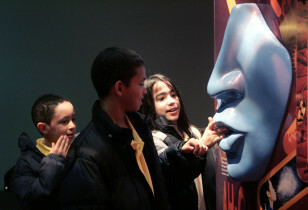 Kids touch a large plastic replica of lips and a nose at the Infection Connection exhibit at the Liberty Science Center in Jersey City, N.J.
For parents, summer brings the annual question: What shall we do with the kids? One option espoused by science educators is to take them to a science museum, aquarium or zoo where outside-the-classroom, hands-on learning might take hold and nurture a new generation of scientists and engineers. At the very least, the experience might help stave off what education experts refer to as summer brain drain while kids laze away the hazy days of summer.